These plans are quite similar to the Amprobe plans but use the GB GDP-902 metal sensor. This unit can be purchased at Lowes home improvement stores for around $12.00. Look for it in the electrical department. See photo 1 for positioning of screw holes, screws and wire holes, and pipe. Take the 12" piece of pvc pipe and align it with the thinner leg of the GDP-902 leaving about 1/2" extending on one end. Mark with a pencil the length of the 902 on the pipe. The pipe where it mates with the 902 should be ground or filed flat but not deep enough to open the side of the pipe, this will make the unit more rigid. It will be necessary to bore out the end of the pipe a bit to allow the ferrite rod antenna to fit inside. I used a 1/2" rotary wood rasp in a electric drill. Chuck the rasp as near the end of the shank as possible to enable you to bore as deep a hole as possible. Bore the probe tip end of the pipe. Gently pry off the cover of the 902 so you can see where you are going to drill. Temporarily tape the 1/2" pipe to the smaller arm of the 902 in the proper position (about 1/2" extending from the open end of the 902 arm and to the bottom of the arm). Drill a hole large enough for the #8 screw through the pipe and the side of the 902 about 7/8" from the closed end of the 902 being careful not to drill into the ferrite rod antenna. Drill the second hole about 3/4" from the other end of the 902 through the pipe and the side of the 902. Remove the tape and separate the pipe from the 902. Drill a 1/4" hole through the side of the 902 about 9/16" from the closed side. Align the pipe with the 902 and mark the position of the 1/4" hole on the pipe. Drill the 1/4" hole in the pipe on the mating side only. Carefully pry the ferrite rod antenna loose from the 902 case. It is held in by wax and can be removed fairly easily. Clean most of the excess wax from the rod, it will be necessary to do this so you will have clearance inside the pipe. There is one screw holding the circuit board in place, remove this screw and gently slip the board out of the case and turn it over. The 4 wires from the antenna are attached to the bottom of the board, two red and two copper color. Cut these wires about 1/4" from the board, these stubs will be used to locate the position of the new wires. Cutting them this short leaves enough wire on the antenna to make the solder joints beyond the trailing edge of the ferrite rod, due to the close tolerance inside the pipe this is necessary. Notice the wires are wrapped closer to one end of the ferrite rod, that is the most sensitive end. It is a good idea at this point to make sure the pipe is bored out enough for the rod to fit into it. Be careful, the wrappings of wire around the rod can be moved out of place if forced. The four wires from the ferrite rod have a coating on them, it is necessary to strip about 1/4" of the coating from each of the four wire ends in order to solder them. A knife or razor blade will scrape this off but be careful. Cut the 5' wire into 4 equal length pieces. Use a magic marker to color two of the wires or mark them in a way you will be able to identify them. Feed the four wires into the 1/4" hole in the pipe and out the long end making sure not to let the other end go into the pipe or you will have a hard time fishing them back through. Strip about 1/4" of the insulation from the marked wires and solder them to the red wires from the antenna. Solder the other two wires to the copper color wires from the antenna. 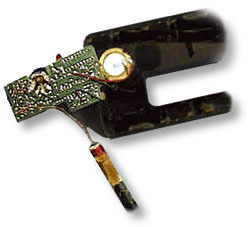 Tape or otherwise insulate the solder areas to prevent them from shorting out against each other. Now it gets a bit tricky. It will be necessary to flaten the wires to the ferrite rod and gently pust the rod into the pipe (be sure to put the most sensitive end toward the probe end)at the same time pulling the wires out the 1/4" hole. The wires from the antenna should extend past the end of the ferrite rod, they are fine enough to fit alongside the rod in the bored hole. It is possible to disturb the coils of wire around the ferrite rod so be gentle, it will be a snug fit. When the rod is nearly in the pipe put a bit of silicone sealant around the end of it so it will glue itself into the pipe. Thread the wires through the case of the 902 but leave some slack for now. Clean the mating surfaces of the 902 and the pipe with pvc solvent. Glue the pipe to the 902 case inserting the screws as a guide for positioning, take up the slack in the wire as you go. Put the nuts on the screws and tighten them gently, don't tighten so much that the case warps. While you have the glue and solvent handy glue the caps on the ends of the pipe. Make a note of how the board fits in the case and cut the four wires to a length that will reach the mounting locations, leave a little slack just to be safe. 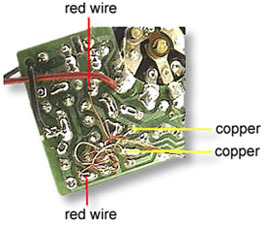 One wire at a time, remove the colored (red) wire stubs and solder the marked wires in their place. Do the same for the unmarked wires but solder them to the copper wire mounting locations. Carefully turn the circuit board over and put it back in the case running the wires under the board and routing them out of the way of the mounting screw for the board. Replace the screw, install the battery and cover and test the unit. The thumb wheel on the probe turns the unit on and adjusts the sensitivity, rotate it until the unit goes silent, that is the proper tuning. It should react to a coin at about 1 1/4" from the tip of the probe, larger items have greater range. Now it is time to go hunting! I am not sure if it is my computer, but your plans refer to 3 photos for the detail. Only one detail photo is showing. Is this planned, or are there other photos referred to that are not in the post? <-thinking->I am not sure if it is my computer, but your plans refer to 3 photos for the detail. Sorry you are having difficulty. Please look again and report back, okay? I tweaked Shiver's original copy/paste post formatting, in order to enhance the possibilities of the 3 photos to show up. Where is that pipe and wire detector? I can't find it anywhere even on the company GB Electrical site. Great job! The pictures came though this time.